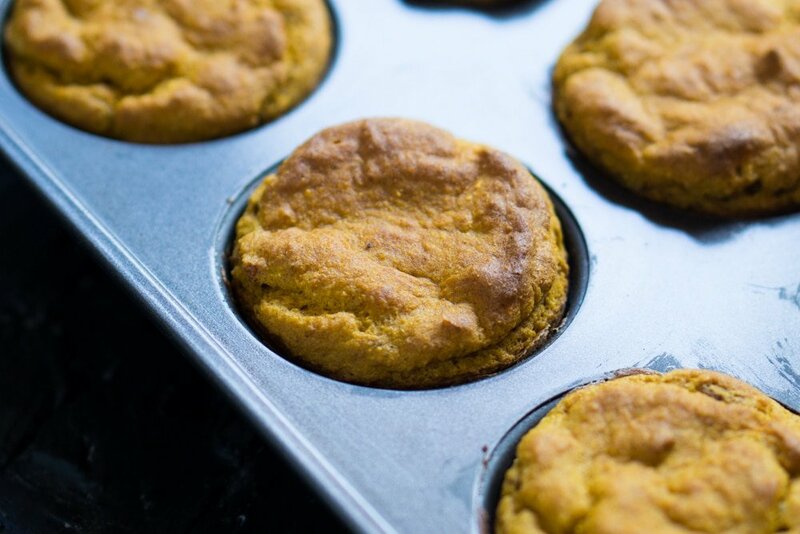 Suuuper Tender & Moist Keto Pumpkin Cupcakes ? Gluten Free, Keto & Paleo Pumpkin Cupcakes ? Anyone else craving pumpkin everything this week? Blame it on the plunging temperatures, but we’ve already been overindulging in pumpkin spice lattes (gf, keto, paleo & vegan!). And now we’re onto suuuper tender and moist gluten free and keto pumpkin cupcakes. Topped with our ultra special cream cheese buttercream frosting. I.e. it’s an ultra special treat. We recently made a homemade pumpkin pie spice batch, with freshly grated nutmeg. And it was killer, so we highly suggest you ditch the pre-made mix. If making the keto version, we prefer a stevia & erythritol blend for sweetener. And we like Pyure best. Or if stevia ain’t our thing, Swerve works great as well! Though do note that we find Pyure to be quite sweet (despite it technically being just twice as sweet as sugar). So be sure to add it little by little to taste! We find 2 tablespoons to be enough, particularly if having with the frosting. But feel free to go up to 3. Fun fact: it might also be our taste buds here, but we’ve noticed that stevia-based sweeteners (such as Pyure) work best when allowed to cool completely. Or even after a thorough chilling. i.e. when we made test batches with Pyure (stevia & erythitrol) and Sweetleaf (stevia), the stevia taste was very prevalent when warm (particularly with Sweetleaf). But after we popped them in the fridge for a couple hours, the stevia taste was barely discernible. If at all. Feel free to read up on our picks for the 10 best low-carb natural sweeteners. And if unrestricted by sugars, we find 4 tablespoons of evaporated cane juice or cane sugar to be ideal. A blend of cream cheese, organic grass-fed butter, Madagascar vanilla, and Pyure. It really is the bomb, so don’t miss out. Plus, nil carbs per frosting serving. But if you really must miss out, we highly suggest a light pecan topping. And you’ll just have to call them muffins, rather than cupcakes. 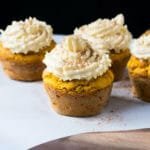 Gluten Free, Paleo & Keto Pumpkin Cupcakes ? 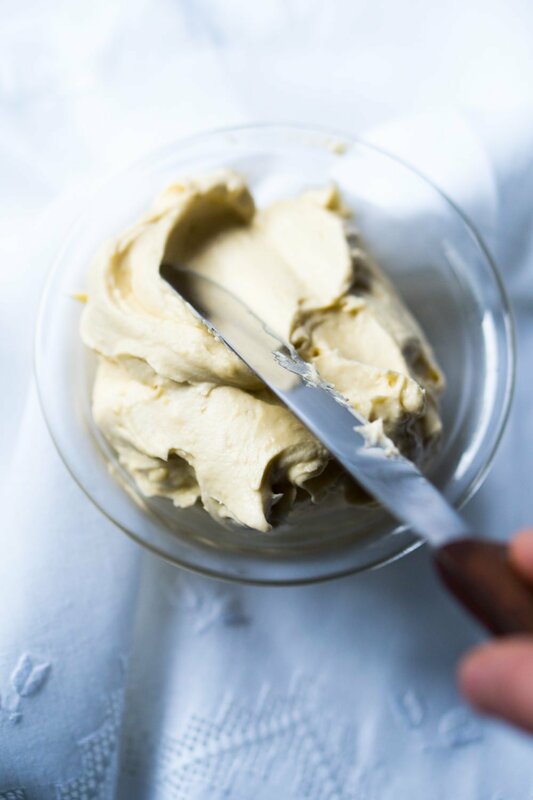 Keto Buttercream Frosting From Scratch ? These grain-free and low-carb pumpkin cupcakes make for an scrumptious sweet treat! Oh, and make sure you opt-in for our homemade cream cheese buttercream frosting, it's killer. Butter and flour muffin pan. Set aside. Whisk together in a medium bowl almond flour, coconut flour, xanthan gum, baking powder, baking soda, pumpkin pie spice and salt. Set aside. Add eggs and Pyure to a large bowl. Beat with an electric mixer until pale and fluffy, 2 minutes. Add in vanilla extract, vinegar, coconut oil, and pumpkin puree and beat until just incorporated. Gradually add in the dry flour mixture, alternating with almond milk. Once fully incorporated, fold in pecans. Distribute batter evenly into pan. Bake for 18 to 20 minutes (covering with aluminum foil at 15), until deep golden and a toothpick inserted comes out clean. Allow to cool for 15 minutes in the pan before removing, and cool completely in a rack before frosting. Make your cream cheese buttercream frosting while your cakes are cooling. And frost away! Keep covered and refrigerated for up to 3 days, though we're fairly certain they'll be long gone before then. *If opting for a stevia sweetener, we like Pyure best. We find it to be quite sweet (despite it technically being just twice as sweet as sugar). So be sure to add it little by little to taste! We find 2 tablespoons to be enough, particularly if having with the frosting. But feel free to go up to 3. And if using Swerve, give them a go with 3 to 5 tablespoons! The 26 Best Gluten Free Flours For Baking & Breadmaking ??? Could I sub HWC for the almond milk? hello I really wanted to make this but cant figure out the conversion to cups. help! These are good at room temp in my opinion, so just let them thaw out xo! Are these just as good the 2nd day out of refrigeration? Any recommendations on serving next day for a Thanksgiving dessert? I haven’t made these yet but I have a question, can I use this recipe as a pumpkin loaf? Or will it not work that way. I do love pumpkin loaf! I have to give my compliments on the recipe. Your baked goods have the best mouthfeel of all the keto muffins I’ve tried. I’ve made these three times now, I weigh my ingredients faithfully and follow your instructions to the best of my ability. I try very hard to keep it precise. I did use Fage Total full fat greek yogurt here, and it seemed fine. I remembered not to use salted butter (omg I can’t believe I did that) and they really hit the spot. I made these today! I just discovered your blog and I have several recipes bookmarked. These were my first of any of your recipes because I had all the ingredients on hand and need a quick snack to grab and go on work mornings. This is by far the best mouthfeel of any keto muffin I’ve ever tasted. I followed your recipe faithfully, weighing everything (I prefer this when baking and it drives me NUTS when grams and mls are not included!) very carefully, making sure to use brands and ingredients that you specified. I am trying to take it easy on dairy and keto-sweets (because they’re just addicting!) so I will have to save your amazing frosting for another time. I really enjoyed the pumpkin cupcakes! Thank you for this recipe. I didn’t have pecans so I used walnuts instead. I don’t cook with artificial sweeteners because they kick me out of Keto. I did use organic honey in small qualities and it still came out well. I am really enjoying your recipes. I would love any tips that you have around baking with honey. Thanks again. Thanks so much for the response. So, for two tablespoons of honey, I should use a teaspoon of arrowroot powder? I’ve never use arrowroot powder so I’m not sure how much to use. Thanks for the recipe. How important is the xanthan gum? I tried making these without it and a had a big issue with bake time. Basically, they ended up taking over 30 mins, and started to burn on top so I had to just pull them out before they were done. Any ideas what could be wrong? Also, is the recipe for 6 regular-sized muffins? I ended up with 8 semi small ones. Can you use heavy whipping cream in place of the almond milk? What’s the quantity of half a batch of cream cheese? Thanks. You can half the serving size in the servings size, and it will be enough to frost a batch of 6 cupcakes. BEST keto pumpkin anything i’ve ever had. thnx! Awww thank you Stacey!! Glad you loved them and thanks for reporting back!! xo! I made these yesterday and they’re fantastic! Forget the usual dry, dense and crumbly keto/paleo muffins…. these are indeed super tender and soft! And mine may have even risen more than yours! Loved them all round, and your frosting….!!! We have more pumpkin and fall goodies coming up! xo! Just made them, may make another batch as opened a big can of pumpkin puree to make. Can they be frozen( minus the frosting of course)? My first attempt at making muffins/cupcakes with this new WOE(keto). Its getting a bit cooler and fallish and the recipe called to me when I saw it and I had all the ingredients. I used Swerve , 2 tbsp , as the sweetener. They look fantastic, nice rise. Haven’t tried them baked yet though the batter off the beaters was yummy. Not a big sweet person for most part and also limiting sweet treats/ dessert to only once or twice a week. This is this week’s treat! Hope to bring in for my coworkers. Butter is softening for icing . Your site looks great, looking forward to trying more recipes! Thanks for getting back to us! We did a freezing test and they do become denser (though still super tasty). If you decide to freeze them, we highly suggest giving them a quick warm-up to get them back on track. p.s. may we suggest you freeze leftover pumpkin puree? Or make our keto pumpkin spice latte? Glad you loved them Cindy! Thanks for getting back to us xo! Thank you for this one from the bottom of my heart! I went ahead and whipped it up after I saw someone on facebook posting a photo and saying they were great. They are indeed GREAT! And the frosting is out of this world! I’m fairly certain I saw that pic as well (their frosting looked much better right?! ?